OnTime currently offers four subscription levels, each with a specific set of features that will benefit your business. Upgrading (or downgrading) is easy and can be done without contract extensions or fees. Follow the directions below to change your subscription. Review the different subscription plans available for OnTime and determine which best fits your needs. Log in to OnTime Management Suite. Select the Account tab and choose Account Center. 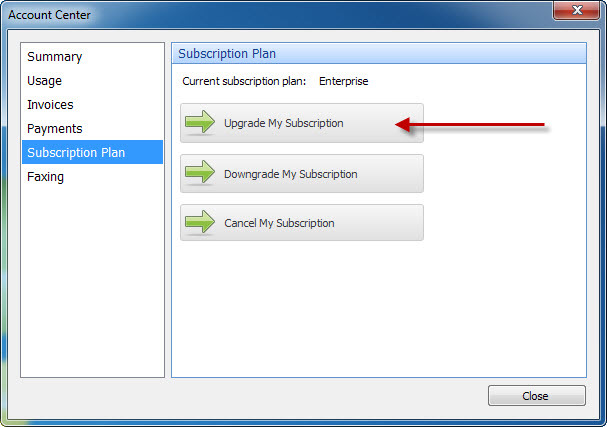 Switch to the Subscription Plan tab in the resulting window. On the change order window that appears, you will see the current account configuration. Change the Subscription Plan dropdown box to the plan desired. Click the Submit Request button to complete the process. For billing purposes, we generally allow you to make these changes once a month; however, if you require that changes take effect immediately, please contact us and we can accelerate your request. Excellent software and service! There is no task Jeremy can't handle. DCS had over 150 drivers in two states and wouldn't have grown to our capacity without OnTime360. Tripled our growth in two years using OnTime.